2010 Nazarene Student Leadership Conference logo. The top student leaders of all the Nazarene colleges will be on campus next month for an annual meeting. 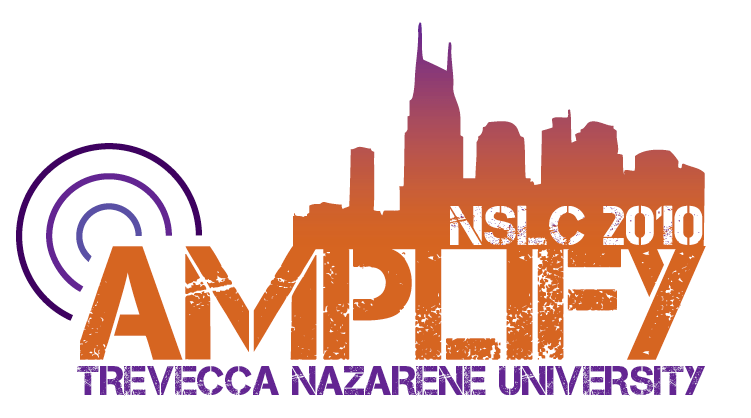 More than 100 visitors will spend the week of April 8th eating, hanging out and sharing rooms with Trevecca students as part of the Nazarene Student Leadership Conference. Since the first NSLC at Olivet Nazarene University in 1964, each group of executive student officers from the nine Nazarene universities come together for a leadership conference every spring. This year’s conference is April 8th – 11th, the theme will be ‘Amplify’. “It’s all about energy, we want to amplify their strengths,” Matthew Spraker, Associate Dean of Students for Community Life said. The purpose of the NSLC is the leadership development of student government, and to share what is going on among the other Nazarene universities. The students involved in the conference participate in devotionals, leadership workshops, and officer group meetings throughout the day. “The goal is to teach them how to use their skills most effectively in order to lead their student body,“ Jared Usrey, Student Body President of Trevecca Nazarene University said. Although the conference is only for student government, Trevecca students will be effected and will also have opportunities to learn and volunteer. As always, when there is any event on campus, the cafeteria will be used to feed the visitors, and may become crowded. Students from Trevecca are encouraged to pull up a chair and join in conversation with the visitors. The group will be attending Friday Night Live on April 9th. Students who have an extra bed or suite may volunteer to host a guest or two for the three nights they are here. “It’s a fun time for Trevecca students to get to know new people and learn about other Nazarene universities,“ Spraker said. The first night of the conference there will be a dodge ball tournament between the student governments of each school. Students are invited to watch and cheer on Trevecca. NSLC has rented out the Music City Queen for their dinner and a tour of Nashville. A few students will have the opportunity to volunteer to help with this.